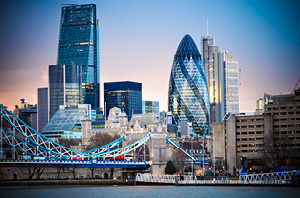 City of London Investment Trust, established in 1891, is one of the oldest and largest investment trusts in the country and has an unbroken track record of increasing dividends every year for the last 50 years. 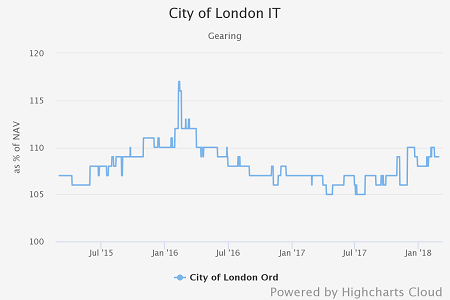 Managed by Job Curtis at Henderson Global Investors since the early 1990s, the trust is well resourced and has outperformed the benchmark FTSE All Share in each of the last five discrete calendar years. In addition, it has maintained an impressive income profile with the trust consistently yielding around 4% for most of its recent history. Job takes a value approach to the market, backing companies he deems be out of favour but offer good upside. Nevertheless, and though he is a bottom-up stockpicker, he also runs the portfolio in a relatively conservative manner tending toward larger companies and not straying too far from the composition of the index. As such, the portfolio has tended to underperform its AIC UK Equity Income sector in strongly rallying markets (which is understandable, given the ‘average’ trust in the peer group is overweight small and mid-caps relative to the index) but it has tended to protect capital more effectively in falling markets – such as in 2011 when it delivered a positive return despite the impact of the European sovereign debt crisis. The £1.4bn trust was slightly behind the index in 2017 and fell behind considerably in 2016, when smaller companies in particular rebounded strongly after the initial shock of the Brexit referendum. As a result over three years the trust has underperformed its peer group – the AIC UK Equity Income sector, where the average trust has a much higher weighting to mid and small caps – by a small margin and is behind the index too. However the tendancy to underperform rallies whilst outperforming during more difficult periods means the trust has a good long-term track record of outperformance relative to the wider UK market. Over 10 years to the end of February 2018 it has delivered annualised NAV total returns of 7.8% per annum, against a backdrop of 6.6% per annum from the FTSE All Share. Though it has struggled to keep pace with its peer group average over the course of 2017 to the end of July, it is outperformed the index over that time with NAV total returns of 7.4%. The trust’s solid yield has won it a strong following and it has regularly traded on a premium to NAV over recent times, as it does today (7th March 2018) at 2%. The board has the ability to buy back shares to manage the trust’s discount and issue new ones to prevent it reaching too high a premium, and has used this feature extensively, issuing more than five million new shares in 2017. Although there is no formal discount policy in place, the board’s active approach suggests that buybacks would be used if the fund traded at a discount for an extended period of time. The trust aims to grow capital and income over the long term and invests in large, well established UK businesses many of which form part of the FTSE 100, the index made up of the Britain’s largest listed companies, such as British American Tobacco, HSBC and Vodafone. 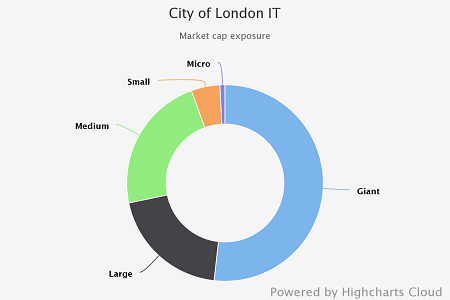 In fact, it has one of the highest weightings to mega caps in the AIC UK Equity Income sector, with the ‘average’ member of the peer group overweight mid and small-caps relative to the index. Some 70% of the portfolio is invested in mega and large-caps, according to data from Morningstar. As such, given that the FTSE 100 index is made up of largely of companies that operate across the globe, City of London (despite its name!) is less reliant on the UK economy than the majority of its peers (Job estimates that more than half of the portfolio’s underlying sales come from outside the UK). The manager has a ‘value’ approach to investing, looking for well established businesses which are out of favour, with shares trading below the valuation he believes is appropriate. The manager aims to add value via stock selection, focusing on company fundamentals to identify target investments; examining their balance sheets to identify potential investments – with a consideration of ‘big picture’ macro issues as an overlay. The manager also meets the management teams who run the companies in which he invests, usually meeting around a third of the companies in the portfolio in a given year. The manager has a conservative approach, investing in profitable, financially secure companies, and the trust is highly diversified, with upwards of 100 stocks in the portfolio at any given time, and he tends to run his winners; portfolio turnover is low at around 15% in any given year. 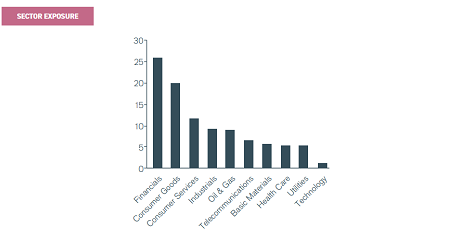 In terms of sector exposure, its largest weightings are to financials, consumer goods and consumer services. It is underweight the likes of energy, basic materials and industrials relative to the FTSE All Share, however, according to data from Morningstar. The trust uses gearing, borrowing money to invest which can enhance returns on the upside, but also emphasise the downside. Historically the level of gearing in the portfolio has ranged between 5% and 12%, tending to increase when the manager is feeling bullish. Presently the trust is geared to the tune of 9%, having risen from a low in the middle of last year when it touched 5%. The trust’s conservative style is reflected in its tendency to outperform the market when it is falling, and underperform when it is rising. 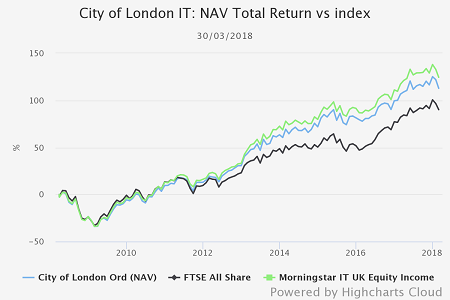 In terms of NAV and share price total return the trust has produced a strong performance versus the FTSE All Share over the short, medium and long term. Over 10 years to the end of December, for example, the trust has delivered an NAV total return of 90% compared to a return of 72% compared to the FTSE All Share. The trust’s conservative style is reflected in its tendency to outperform the market when it is falling, and underperform when it is rising and recent performance expresses that perfectly. In terms of NAV and share price total return the trust has produced a strong performance versus the FTSE All Share over the medium and long term but has underperformed index and peers in the last year or so. Over 10 years to the end of February, for example, the trust has delivered an NAV total return of 112% compared to a return of 82.6% from the FTSE All Share, but over three years the index – which has rallied strongly since the brief ‘flash crash’ which followed the referendum – is ahead, delivering NAV total returns of 18.8% versus the trust’s 15.1%. 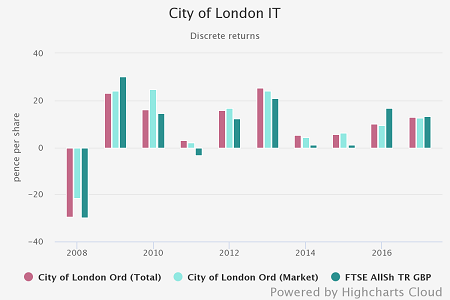 City of London has an unbroken dividend track record, having increased its distributions to shareholders in each of the past 51 years (which is the joint longest record out of all UK-listed investment trusts). So far this year it has paid two of four dividends, both at 4.3p. The quarterly rate will be reviewed by the board before a third interim dividend is paid by the trust in April. It has also consistently offered a high yield relative to the index and its peers. At the time of writing, the trust yields 4.2%. The board has paid a covered dividend in each of the past five calendar years, having had to dip into revenue reserves in 2011 to fund the dividend. While this means the trust’s revenue reserves have been on the increase, its revenue reserve cover (as a proportion of total dividends paid) has generally fallen over recent times and is low relative to the AIC UK Equity Income sector average. This is because of the sheer number of shares the board has issued over that time, which as a result, has increased its dividend obligations each year. Job Curtis has managed City of London investment trust since 1991 and works as part of an 11 strong global equity income team at Henderson, working closely with James Henderson and Alex Crooke, two of Henderson’s most senior managers, as well as Ben Lofthouse and Laura Foll who also manage portfolios in the group. In recent years, the trust has traded at a fairly steady premium, thanks largely to its income characteristics and more defensive nature. 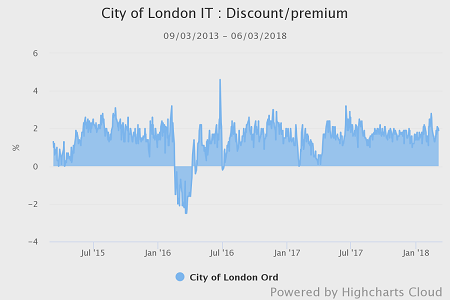 While it did trade on a slight discount at points during the early stages of 2016, it traded on narrow premium throughout 2017. As of the 7 March 2018 the trust was trading on a premium of 1.9%, which is slightly lower than its average for the last twelve months. The board has the ability to buy back shares to manage the trust’s discount and issue new ones to prevent it reaching too high a premium, and has used this extensively in the past to manage the premium, issuing more than 5m new shares in 2017. At 0.42%, the trust has the lowest ongoing charges figure (OCF) in its sector, where the average trust has an OC of 0.56%. No performance fee is levied. The size of a trust affects the OCF and it can be the case that a larger trust has a lower OCF than a rival even if both have the same annual management, because of other factors such as economies of scale.